Didier Drogba will miss Ivory Coast's Nations Cup qualifier against Rwanda after being knocked out during Chelsea's 3-1 win over Norwich. 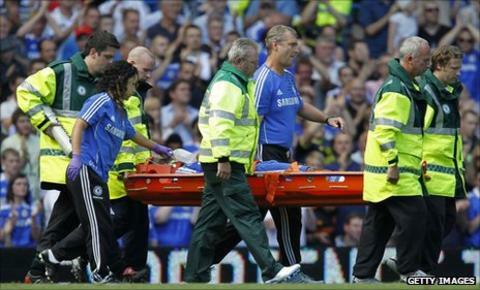 Drogba was due to travel to Africa on Monday but stayed in London under the Chelsea medical staff's supervision. The 33-year-old was knocked unconscious when he went up for an aerial challenge with Norwich goalkeeper John Ruddy and landed in sickening fashion. The Ivory Coast captain was carried off wearing a breathing aid. The West African side has already qualified for next January's finals in Equatorial Guinea and Gabon. After the game Blues manager Andre Villas-Boas said: "The doctor did a great job. We hope for his well-being as a person first. He is showing progressive signs of recovery." Villas-Boas said he had no problem with Ruddy's challenge but said of the incident: "It looked pretty nasty. He lost consciousness completely on the pitch. "I have to be very, very grateful, not only to my players but to the Norwich players and to my medical staff for reacting so quickly to a potentially dangerous situation." Drogba's injury scare was just one of several dramas in a game which was ultimately decided by a controversial late penalty which sparked a major flashpoint between the benches, with Norwich boss Paul Lambert shoving Chelsea coach Jose Mario Rocha after the latter entered the visitors' technical area to celebrate. Lambert said: "I don't know who he is but he's flown right into our area. I'm not fluent in Portuguese so if he understands Glaswegian then he might know what I said. "You don't do that - it's disrespectful." But Villas-Boas hit back, saying: "I know Paul was excited, not only with that. It's difficult to control your own emotions on the bench. "But I would find it very, very strange if my technical staff would be disrespectful of Norwich and maybe they were just showing some emotions. "If Paul can't handle that, I'm sorry - unlucky." Lambert also questioned whether the penalty - given after Ramires went down under Ruddy's challenge - should have been awarded. Branding referee Mike Jones' decision "harsh", he added of Ramires: "I think he's lost control of the ball. He's actually going to ground before he's got it. But the referee's only got one take on it." Norwich competed well against Chelsea, and managed to equalise Jose Bosingwa's stunning 25-yard shot through Grant Holt after keeper Hilario's blunder on the edge of the box. But the penalty - which also saw Ruddy sent-off for a preventing a goal-scoring opportunity - turned the game and Chelsea's victory was sealed in stoppage time when debutant Juan Mata took advantage of Ritchie De Laet's error to make it 3-1.